I don’t eat protein or snack bars that much anymore. Used to eat a P90X Protein Bar every day two years ago but stopped when I realized I was getting enough protein from the foods I eat. The only times I buy a protein/snack bar anymore is when I’m on a road trip and pick one up at a gas station. After this years Super Bowl I kept seeing articles pop up mentioning Tom Brady’s legendary workout and nutrition plan. The more I read the more I was in awe of what Tom does. I guess if you want to continue playing in the NFL at age 37 and win Super Bowls you need to take extra good double special care of your body and it’s what Tom does. I always tell people you can’t spell Brady without Brad and this is why Tom is so successful. I digress. Anyways, I got to a point in the article where it starts talking about what he eats. Take that diet. It’s seasonal, which means he eats certain things in the winter that are considered “hot property” foods, like red meat. In the summer, when it’s time for “cold property” foods, his diet is mostly raw. He subscribes to the 80-20 theory — but it’s not 80 percent healthy food, 20 percent unhealthy. It’s 80 percent alkaline, 20 percent acidic. The idea, he says, is “to maintain balance and harmony through my metabolic system.” That’s why teammates always see him with hummus, raw snack bars packed with nutrients and what one teammate calls “that birdseed s—.” This is the same guy who once ate Christmas breakfast with the Evans family and quietly picked all the sausage out from his omelet. Spent an hour learning about the alkaline diet (similar to the Ultimate Reset diet) and searched for raw snack bars. The first company that popped up was Raw Revolution. Curious to see what these snack bars were all about I decided to buy some. Had a gift card to Amazon so I bought two of the Raw Rev 10 Flavor Variety Pack. The flavors I received were Spirulina Dream, Golden Cashew, Chocolate Coconut Bliss, Chocolate Crave, Coconut Delight, Chocolate Raspberry Truffle, Almond Butter Cup, Cherry Chocolate Chunk, Chunky Peanut Butter Chocolate, and Cranberry Almond & Coconut. Here is what I thought of each flavor. Raw Bars have a Fig Newtonish first bite followed by the flavor. Cherry Chocolate Chunk – Tastes like a ton of cherry’s and chocolate mashed together and made into a bar. The taste doesn’t stick around too long after taking a bite. Chocolate Crave – Very chocolatey. Cashews mix in well with it. Coconut Delight – Like a chewy granola bar with very small bits of coconut. Chocolate Raspberry Truffle – Heavy chocolate taste with a splash of raspberry. Chocolate Coconut Bliss – Very coconutty. Spirulina Dream – This is a weird one. It looks like they smashed in a bunch of cashews into kale. It looks green and tastes green. Cranberry Almond & Coconut – Has a granola bar taste with bits of coconut and almond. Shocking – I know. As you can see there are only 7 flavors up there but I had 10 sent to me. It turns out that somebody took the Golden Cashew, Almond Butter Cup, and Chunky Peanut Butter Chocolate out of the last bag we had in the house before I decided to write a review about these bars. I apologize. 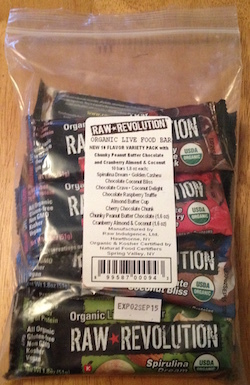 What I noticed about the Raw Bars versus other snack bars I’ve had like Clif Bars or even the P90X Protein Bars is the flavor to the Raw Bars doesn’t jump out at me and stick around like it does with the others. I have reason to believe this is a good thing because the Raw Bars do not have any artificial ingredients in them which might give more flavor to it. I’d compare the Raw Bars to eating an apple. It doesn’t wow you with its flavor but you know its good for you and keeps you full. When you’re done with it you forget about it. I’m not sure if I’ll buy another bag of them because I don’t keep snack bars in the house. At roughly $2 a piece I feel that puts them inline with other snack bars. If anything, what I will now do is reach for a Raw Bar if available at a gas station the next time I’m on a road trip.